For nearly a decade the A.S.P. GRYPHON has represented the pinnacle of design and performance in an analog interconnect. In a field saturated with competing contenders, the GRYPHON has reigned supreme and withstood the test of time. Although many said it could not happen, the time has come to pass on the crown. Introducing the all-new A.S.P. GORGON, a fully re-invented reference level interconnect with many unique features, exclusive technology and best of all, astounding capabilities. Expanded cross-section conductors, superior shielding and enhanced mechanical damping push distortions further out to a nearly non-measurable level. Any high-resolution system will reach a previously unattainable neutrality and realism. A presumably impossible perfect lens that does not color or alter any particular frequency traveling through it. Made completely by hand with absolutely no "off-the-shelf" or commercially available components. 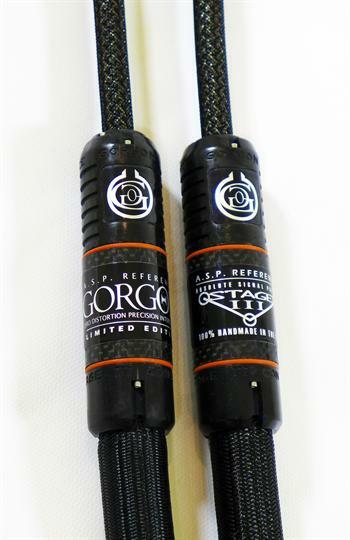 All GORGON interconnects are terminated with our proprietary HYPERION advanced RCA or XLR connectors. We invite you to experience the razor-sharp accuracy of the A.S.P. GORGON; your expectations, and your system, will never be the same. A.S.P. REFERENCE GORGON interconnects employ 4 cryo-treated, expanded cross-section, custom slow-extruded silver/palladium AeroStrandUltra™ ribbon conductors in a quad helix configuration. Vacuum dielectric; Nylon and FEP Teflon inner core drawn to 675mm.Hg. H.D.A. 100% radiation invulnerable shield + exclusive ASPIS ™ outer shield (woven plated copper/conductive Nylon). Multi-layer construction with ferrite, ceramic and high density alloy granules for enhanced mechanical damping/shielding. Custom hand made woven carbon fiber housings. Terminations: Cryo-treated, HYPERION silver RCA or XLR connectors with ceramic-infused polymer insulators, (custom made by Stage III Concepts).